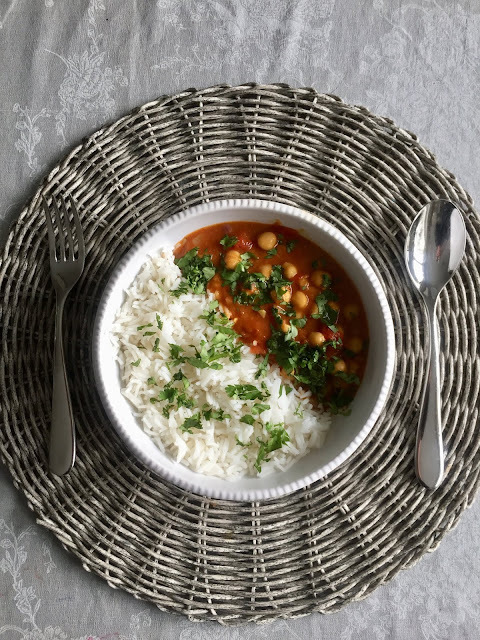 I've just discovered this delicious, healthy dish, and as soon as I tasted it I knew I had to include the recipe on the blog. It's such a hearty, tasty meal. The recipe can be doubled or trebled to feed a crowd which is exactly what I did when we had dinner for 10 in our house a couple of weeks ago. The original recipe is from The Happy Pear's YouTube channel where they manage to make the dish in five minutes flat! Their recipe makes plenty for 3-4 with leftovers, and it can also be easily packed up for a working mid-week lunch. I've adapted it slightly so if you follow the recipe here it takes a little bit longer - sorry about that! But you can find the really quick YouTube version here. I also didn't use chilis which I love but I wanted it to appeal to as many people as possible when serving it to a group. And as I know people can have a love/hate relationship with coriander I served it on the side to be spinkeld on as people wished. In a small pot heat 2 tablespoons of olive oil over a medium heat and fry the garlic for a minute or two until it turns a golden colour. Add the tin of plum tomatoes and simmer gently for about 20 mins until the tomatoes soften. In a separate pan fry the onion in a tablespoon of olive oil for a couple of minutes until beginning to colour. Add the ginger and fry for a minute before adding the spices. Mix to coat the onion and ginger and cook for 30 seconds to just warm the spices. Add the simmering tomato sauce, coconut milk, chickpeas, lime juice and salt and pepper to taste. If you're like me and LOVE coriander sprinkle a generous handful on top. Serve with rice or cous cous and sliced avacado.